Today my friend Heather at Parenting Patch asked a Hot Topic Tuesday question: do you wear your baby facing in or out? I’ve been fairly variable with adventures in babywearing. I’ve done a lot more adventures in babywearing with Eudora than I did with Norton, but that’s generally because Eudora is much clingier than Norton ever was. My style of babywearing has changed quite a bit with each of my children. 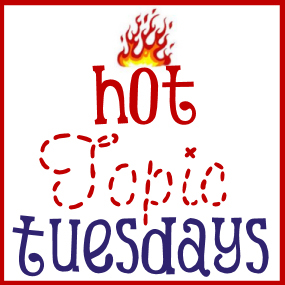 Hot Topic Tuesday – Are Locked Doors Safer or Hazardous? I never thought that whether one did or didn’t lock a toddler in their bedrooms would be a hot topic. Whether a parent is for or against door locks, there is one thing that they all agree on: it’s a safety issue. Fire safety comes up a lot in this topic: pro-locked door parents prefer it because they know where their kid will be in the event of an emergency and can get to the child in a hurry. Opponents of door locks denounce it because the kid doesn’t have a fighting chance at getting out on his or her own. I’ve heard all kinds of things on the ‘net about restaurants that have made a conscious decision to ban children below a certain age. Some parents are enraged. Some parents are thrilled that there are now options to have a quiet meal without listening to someone else’s children. As for me, I love the idea. A whole lot of people criticize the toddler leash. It’s okay; I totally understand why they aren’t fans of it. A favorite reason for criticizing the toddler leash is that children are not dogs. The husband bought our son a toddler leash when he was smaller, but we haven’t really used it much. Now, though, I use that toddler leash any time we go somewhere that doesn’t have a shopping cart and isn’t particularly stroller friendly.